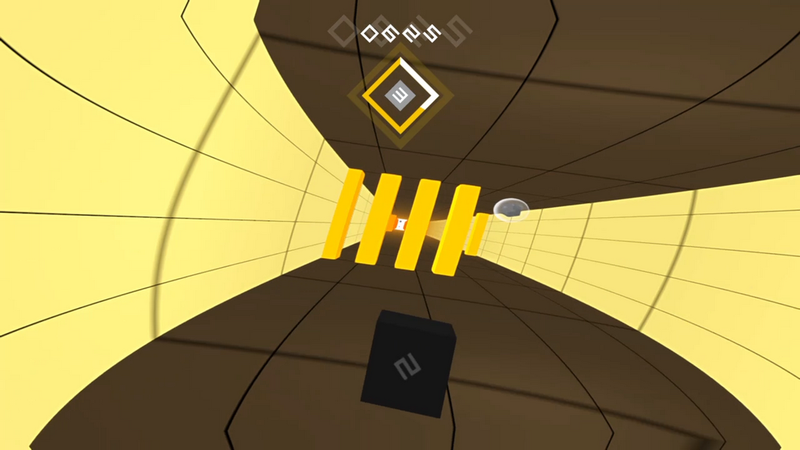 Velocibox – one of the hardest games we’ve ever played – blasts onto the PSN platform. If you thought Super Meat Boy was too easy, check out this review. Velocibox is a hard game, and it doesn’t waste any time letting you know. My first game…. about 10 seconds long. My second attempt… 12 seconds. My third…. 7 seconds. You get the drill. So why keep trying? We’ve seen a lot of “endless runners” over the past few years, where your only goal is to stay alive as you automatically move through a level – only timing your move and jumps to make sure you don’t hit an obstacle and die. Velocibox is such a game, but doesn’t feel quite as endless at first – since the end always seems to close. In Velocibox, you get blasted into a 3D corridor at breakneck speeds – and you only have a fraction of a second to respond to the obstacles in your path. The controls are simple you can move sideways and onto walls, or flip the screen upside down, swapping left and right in the process as you switch from ground to ceiling. What makes the game so hard, despite its easy to understand control scheme, is the reaction time you’re allowed in between obstacles. That’s what got me killed so soon in my first, second and subsequent games, and when I thought about memorizing an ideal path – I soon found that there is no such thing. With all the moving, twisting and flipping, it’s almost impossible to remember a sequence and replay it in your head – you’ll just have to rely on reflexes you never thought you had. Frustrating? Sure, but the game walks a fine line between frustration and the will to improve your best score. If you’re not up to the task, Velocibox is sure to frustrate you – but if you like challenging games then they don’t come any harder than this one. Initially available on the PC, the game can now be played on PS4 and Playstation Vita as well. Its minimalistic (but high res) art style transfers well to both PSN platforms – the screen doesn’t become too cluttered for the smaller Vita screen and everything is big and bright when playing the PS4 version. Having said that – it’s a little easier to progress in the PS4 version because obstacles that appear in the distance are (by nature) larger and thus appear to become clearer a fraction of a second sooner than on the small screen. Velocibox is only meant for a certain group of gamers. Those looking to prove themselves despite overwhelming odds, and those who have reflexes that others can only dream of. If you feel like you might very well be part of that group, then this game has that “one more try” feeling for you.